This month we found something so incredibly fun and memorable we just had to share it. We love clothes, of course we sell clothes so of course we love them. We try to keep our clothes nice for as long as possible so our boys can wear them well. But what happens when our little boys aren’t so little anymore? What happens when they grow up and we have all of these adorable little man clothes that the used to wear and seemed so tiny in? Well, now you can reuse those clothes and keep them forever. So that you may always remember how adorably little your little man looked and how soft he was when you held him so close. In our monthly perusal of the internet we stumbled upon an incredibly crafty momma named Kacia. 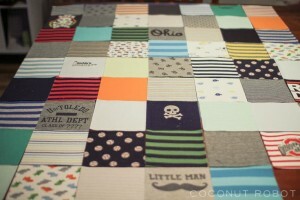 Her blog, Coconut Robot is all about making something beautiful. She is certainly good at it with all of her sweet and beautiful crafts she shares on her blog everyday. We are so completely enamored with her sweet memory quilt idea. Now you can take all of your favorite baby and toddler outfits from your little ones and treasure them forever in a sweet little quilt. Katia gives an incredible step-by-step tutorial, with easy-to-follow photos for those that need to see what to do. We are so happy to share this sweet idea since it is a project close to our own hearts. Now when your boys are done wearing their favorite The Boy’s Store looks from infant and on you can reuse them and complete your own special memory quilt that you and your boys can hold close for years to come. All you need to do is gather all of your child’s favorite old clothes, give them a good washing, and head on over to Coconut Robot for some incredibly easy steps to creating something you will treasure forever. This entry was posted in boys clothing, Shopping and tagged baby boys, baby boys clothes, baby boys clothing, baby boys fashion, baby boys outfits, baby quilt, boys clothes store, boys clothing, the boys store on June 4, 2015 by Lacy. This month we are going to highlight a great summer brand instead of an entire outfit. During the summer your kids spend a lot of time outside in the hot sun. Whether they are out playing in the yard, swimming in the pool, or on vacation in some great destination they need to protect themselves from the sun. As parents we know the first line of defense against the sun is sun block and staying covered up but did you also know that your kid’s eyes are at high risk in the sun as well? Your kid’s eyes need protection from the sun too. While hats are great protection for the face they are sometimes not enough to guard against harmful UV rays. That is why your kids need some great glasses to keep them protected from the sun, and also looking really, really cool. MFS Eyewear offers eye protection for boys of all ages with great style. Check out some of the great looks your little men can sport this summer to not only look cool but protect those fabulous eyes as well. Ball Game Shades by My First Shades: These great red shades are perfect for your youngest little man. 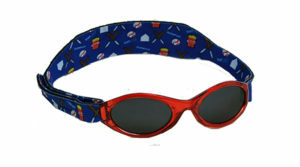 With a blue adjustable neoprene band to hold them on they will stay on even your youngest and most wiggly little guy. 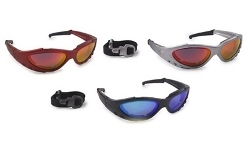 They are also ultra cool featuring a baseball theme on the headband, they are also impact resistant, and have shatterproof frames and lenses making them safe too. Extreme Sports Sunglasses by MFS Eyewear: Boys are into extremes, whether they are playing or training and these glasses are perfect for both. They feature a neoprene band to hold them in place while your boy does all his most amazing and awesome tricks this summer whether on his skateboard, surfboard, or wakeboard. Xtreme gear Convertible by MFS Eyewear: These glasses are ultra hip and will impress even the adults with their style. Now your kids can look as cool as their idols but in glasses made just for them. This entry was posted in Accessories, Activities, Health and tagged Accessories, Activities, baby boys fashion, boys fashion, fun, MFS Eyewear, summer, sunglasses, the boys store on July 16, 2012 by Lacy.